So now let’s think about the movement of heat into and out of a body of water (or the ground). Check Your Thinking: What happens to the temperature of a lake over the course of the summer? What causes this to happen? The reason that the angle of the rays is different in summer and winter has to do with the angle (tilt) of the Earth in relationship to the Earth’s elliptical path around the Sun. Contrary to popular belief, in the northern hemisphere, the Earth is actually closer to the Sun in the winter than in the summer. The closer you are to the equator, the warmer the lake will be, because the angle of the rays of the Sun are closer to 90o for a longer number of days. 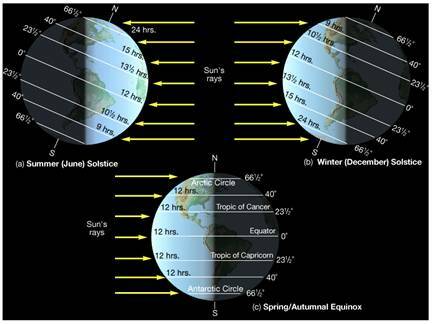 Figure 5.19: The image above illustrates changes to the angle of the suns rays as they reach the earth at different times of the year. Figure 5.20: The tilt theory of seasons. The Earth is the little circle shown at four positions in its orbit, and its axis is the short diagonal line. The axis always points in the same direction, but because the Earth moves in its orbit, the axis leans toward the Sun in summer and away from the Sun in winter. Diagram courtesy of Yerkes Observatory. Check Your Thinking: Now, what happens to the temperature of the same lake in the winter? And what causes this to happen? Activity: Shine a flashlight down onto the top of a table. When the flashlight is pointing directly down at the table, the circle of light is much smaller than when the flashlight is shining on the table at a low angle. If the circle of light represents the rays of the Sun as they hit the Earth, the rays of the Sun are much closer together in summer, making the sunlight more intense. In winter, with the sunlight entering the atmosphere at a low angle, the rays of sunlight spread out. There are fewer rays of light per square meter, thus there is less sunlight hitting each square meter of the Earth. Activity: Examine the circle of light as you shine a flashlight on a globe at different angles. In summer, the northern part of the globe points towards the Sun. For a diagram of this, see Earth Rotation and Revolution from PhysicalGeography.net. Activity: Have your students measure the angle between the sun and the horizon on different days throughout the year (be careful not to allow the students to look directly at the sun when doing this). Record this data at the same time each day or week (preferably close to noon). Have students create a graph of the data throughout the year. They could compare this data to temperatures and number of hours of sunlight each day or week. To help students understand how solar radiation varies (duration and intensity) during the year and relate this to phenomenon on the Earth’s surface, refer to Exploring Solar Energy Variations on Earth from the GLOBE Project (pdf). Large bodies of water (oceans and lakes) can store very large amounts of heat. Heat moves into and out of bodies of water on a daily and seasonal basis. In areas of the Earth close to the poles, solar energy hits the water surface more directly in summer than in winter. Solar energy is absorbed and that energy is converted to heat, thus the water gets warmer over the course of the summer. Polar ice and glaciers melt to a certain extent each summer. In the autumn, the reserve of heat in oceans and lakes is transferred from the water to the atmosphere through evaporation. As the stored heat gradually escapes over the course of the winter, bodies of water eventually may freeze over. Polar ice caps and glaciers expand their floes of ice. In spring, the amount of sunlight hitting the water surface increases, and the cycle continues. Download the Heat Flow in Snow and Ice – Change in temperature and mass activity (pdf) for a simulation of what occurs on a lake that is covered with ice and snow. Perform the activity with your students to help them understand that snow and ice slow down the loss of both heat and mass from bodies of water in winter. In addition to the insulating effects of snow, ice also plays an important role in the picture because, while it is not nearly as effective as snow in holding in heat, is it quite effective in holding in water (mass). In other words, because ice forms a cap on the liquid water, it prevents evaporation of water from the seas and lakes. If you prevent or slow down evaporation of water (matter or mass), you also slow down the rate of heat-loss, because the water (mass) is holding lots of heat.